Honoring the History of Maritime Heritage! Well, it is with regret to say that I am no longer able to continue with the build. My wife and I started a little business that requires my attention everyday so I am no longer on site. I miss the crew and the Chalupa very much (especially now that it is so close to being dropped in the water) but I will continue to post to the blog as best I can. Thanks to the volunteers I’ll add whatever pictures they can send me to keep you all updated on the progress. Here’s a series of pictures sent to me by Maury this weekend. More pics of the Laps! The hull of our baby is nearly done and now time to work on the inside! Ernie and Pete are starting on the floor. Another view of the mess…hey!, it worked! Gordon and Clay (on ladders) and Maury, Alyn and John inspecting the progress. Clay “squeezing” the bow to starboard. We hope you all had a Happy Thanksgiving and as the holidays continue we get back to the work at hand. The last of the Caraval planks are in place and the next step will be the attaching of the lapstrake planks. These next planks will overlap each other above the water line by between one and two inches. 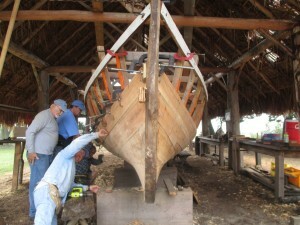 Alyn, Clay, Gordon and John examine the fit of the last caraval plank on the starboard/fore side.